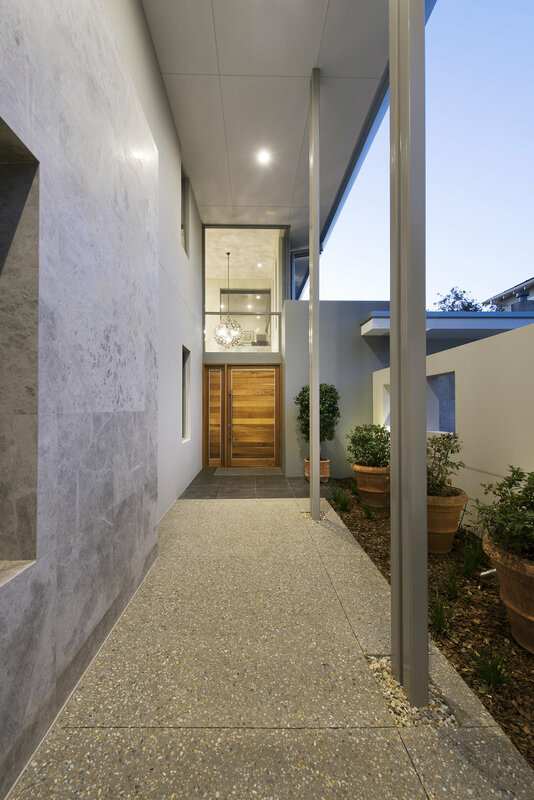 With an impressive double-volume entrance setting the tone, this ‘modern natural’ home design combines contemporary and natural materials as effectively as it combines form and function. The zoned layout unfolds from the entrance hub, providing a separate living space for adult children and a secluded master bedroom wing, as well as an office/home theatre and family living, dining and kitchen area. There’s a large underground garage and store – all incredibly practical, all designed to embrace the site’s northern orientation. This is an elegant home too, with a cohesive form that brings natural materials like stone and timber together with a modern colour palette and render, creating overlapping planes and an unmistakably sophisticated ambiance.